Why is the D-50 important historically? The Roland D-50 was the first big hit Rompler with a twist. Just after the huge success of the Yamaha’s DX-7 FM synthesis the rapid evolution of technology brought the option of using short digital recording of actual sounds as the raw waveform in synthesizer. The D-50 is not a sampler because it cannot record any sounds. You are limited to the PCM audio wave recorded, prepared by Roland and printed onto the ROM memory of the device. Hence ROMpler or ROM Player. You could also buy memory CARDS to expand the amount of storage or simply buy new factory created patches. It uses Roland’s LA Synthesis for Linear Arithmetics because it combines PCM waves (LINEAR) with the option of summing 2 waves using Ring modulation (Arithmetics). Ring modulation where not new but this combination of PCM wave + digital synthesizer either in mix or Ring mode was unique. On top of that, the D-50 had an EQ, a reverb ( or chorus or delay). All of this was cutting edge technology in 1987! It came in a moment in history between years of analogue synth and at the beginning of the digital era. It was sounding totally different than analogue and could produce sounds impossible to create up to that point in time. It was the right device at the right time with the right sounds at the right price. It was a hit! The next question is why would a D-05 be interesting today? The LA synthesis! One question we could have today is : “Why would I want a D-50 Clone today?”. The D-50 was a great milestone in synthesis history. To understand the Roland D-05, we have to go back to the original D-50. The D-05 is some much a D-50 clone that it even support the SysEx (System Exclusive) messages that are suppose to be “exclusive” to the D-50. In other words: The D-05 can receive the patch memories of the D-50 and play them accordingly. You can also use a System Exclusive (or SysEx) editor librarian to create and manage the D-05 internal memory. So let’s go back to the original D-50 manual to really get a grasp of this device can do. The true power of LA Synthesis lies within the digital Synthesizer section of the D-50. Remember, first of all, that this is a totally digital instrument, even though the sound would seem to suggest far more. Through LA Synthesis, the D-50 appears to have four powerful synthesizers built in. Each of these hypothetical synthesizers could behave like a conventional analog synthesizer, or a PCM sampled synthesizer. 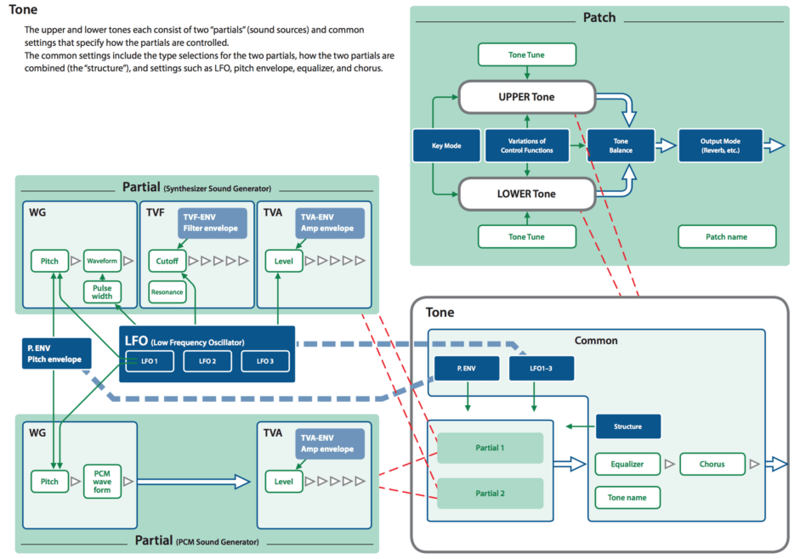 Consequently, they are referred to as PARTIALS, since they are far more than just a pure synthesizer. These Partials are combined in pairs to form a TONE. 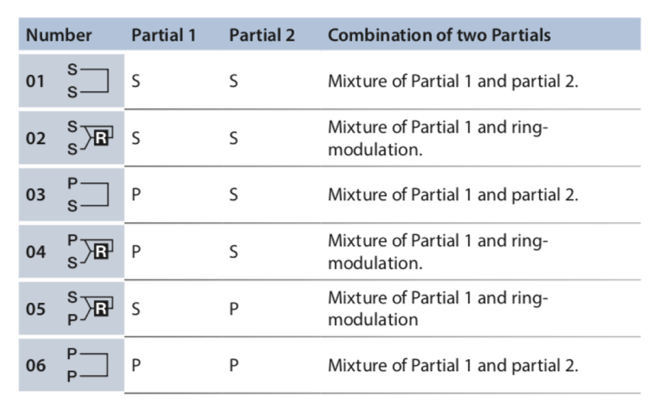 A Tone could be a mix of the two Partials, or they could take advantage of the LA version of cross modulation. In this way, some of today’s more popular digital sounds are remarkably easy to achieve. One of the visually noted features of the D-50 is the joystick. It can control the balance between Tones (up/down) and partials (left/right) or be use to quickly enter the value of the parameter on screen. 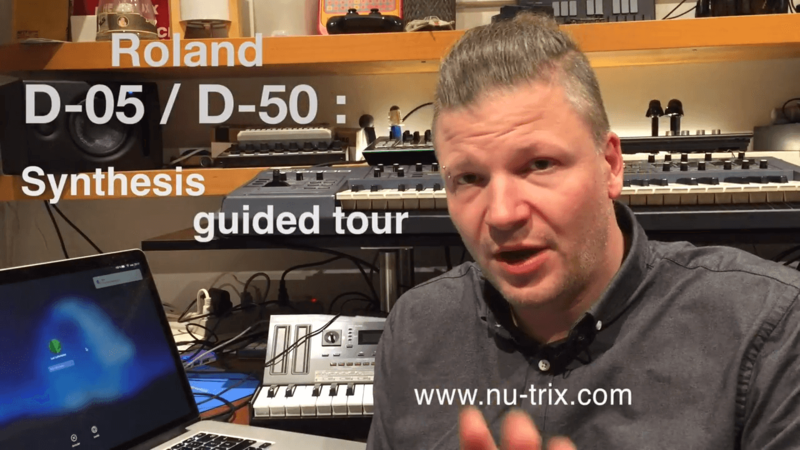 Before go in the guided tour of the D-05 synthesis, lets explain the internal structure. 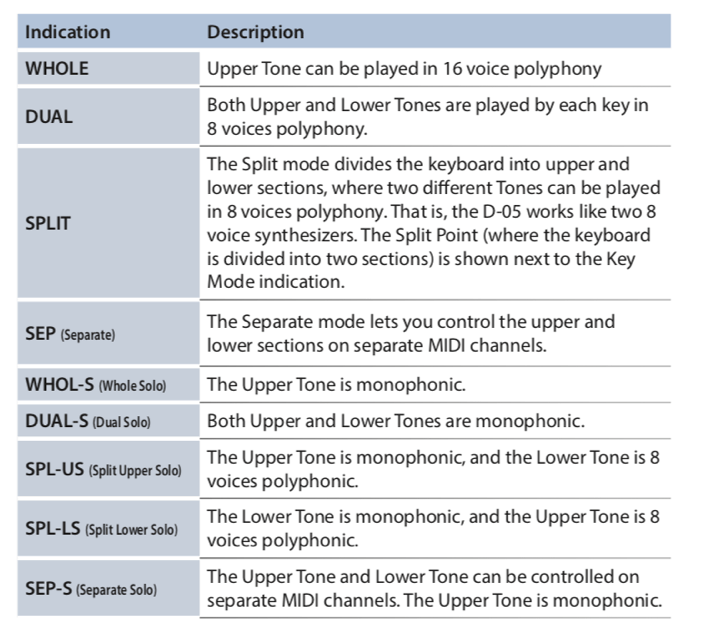 Each TONE can have 2 PARTIALS. Roland explain it this way in the D-05 Manual. Using the Breadandbutter sounds Roland D-05 editor http://breadandbuttersounds.com/#D05Editor, I made this video for a guided tour of the Roland D-05 synthesis. 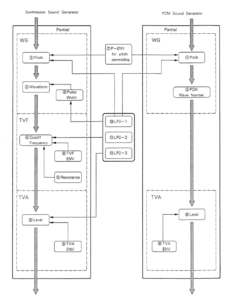 Do you know how to build a SysEx messager for D-05? 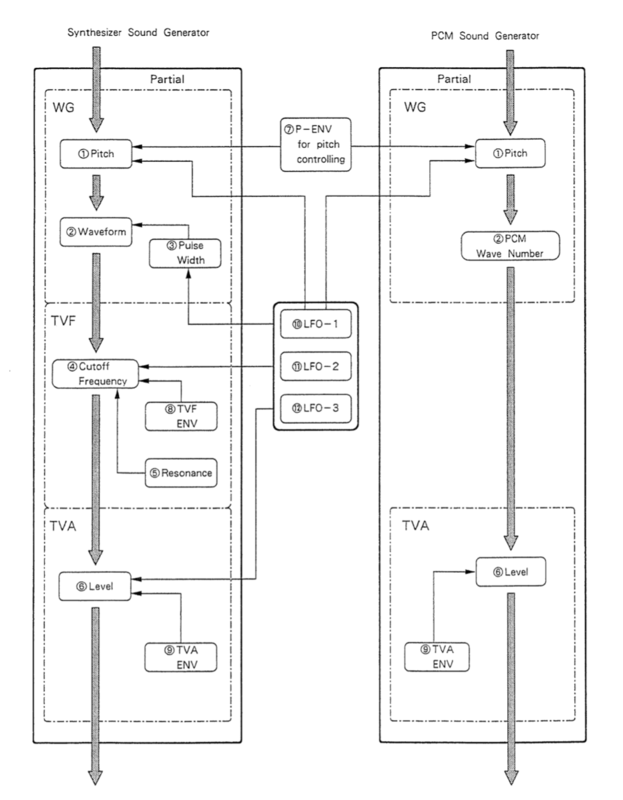 For example, if I want a specific controller to change partial 2 cutofffrequency, how do I write the SysEx message? ?